This book is a collection of traditional folksongs, Irish and American fiddle tunes, adaptations of classical pieces, and original songs. The songs combine melody lines in standard notation with suggested chords for accompaniment. 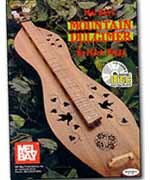 Unlike Mark's other books, Mountain Dulcimer is best appreciated by a player of intermediate to advanced capability who wishes to learn how to add chords behind a melody line, or how to use octave and rhythm changes in creating an effective arrangement.